Who knew – Santa comes in different versions! You have to love the thoughtful comparison chart which lets you determine which jolly old Elf you can afford – gloves or no gloves, the Corduroy-look polyester Santa suit or the Rayon Acetate velvet style. And it’s not just about the suit. You’ll need Santa’s gift pack, and you may well want the “Santa Stomach Pouch” which “makes any man a round, jolly Santa.” (Yes, I suppose you could use pillows, but pillows don’t come with “adjustable straps that make it easy to slip on and off.”) Completing the package is an utterly unconvincing cardboard fireplace. 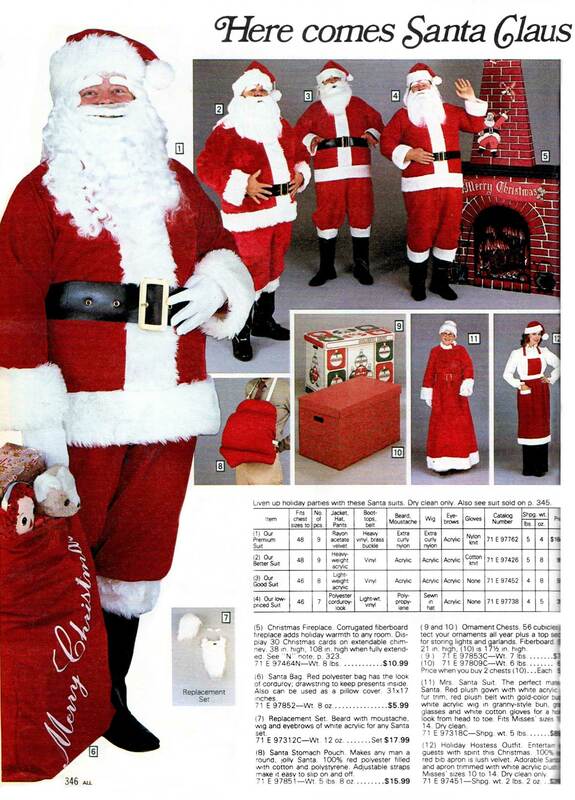 1983’s Sears Santa suits ranged from $40 to $165 without accessories. Actually, the page before this one pictured Sears’ better-than-premium Santa suit, which was made of super-plush velvet with “shoulder pads for a tailored fit.” A total of 10 pieces, with glasses and an “Extra-curly nylon wig”, it would set you back a serious $280 — not including stomach pouch. Santa with Shoulder pads. Well, it was the 80s, after all.